Nicolò Piredda, a student of the Master in Yacht Design organised by the School of Design, Politecnico di Milano, in collaboration with Poli.Design, has won the 2018 Young Designer of the Year Award in the student category, along with Damien Bovie for the professional category. The Award, sponsored by Oceanco, was presented during the Boat International Design & Innovation Awards on Sunday, January 28th in Kitzbühel, Austria. Piredda’s entry Galàna impressed the judges with its practical and elegant exterior design. The 24-year-old student met the brief exactly with his general arrangement, while his masterful use of design development sketches was also exceptional. Nicolò Piredda studied at Liceo classico Giorgio Aproni in Nuoro, Sardinia. He moved to Milan soon after getting his diploma, where he also got his bachelor degree in Interior Design at Politecnico di Milano in 2016. 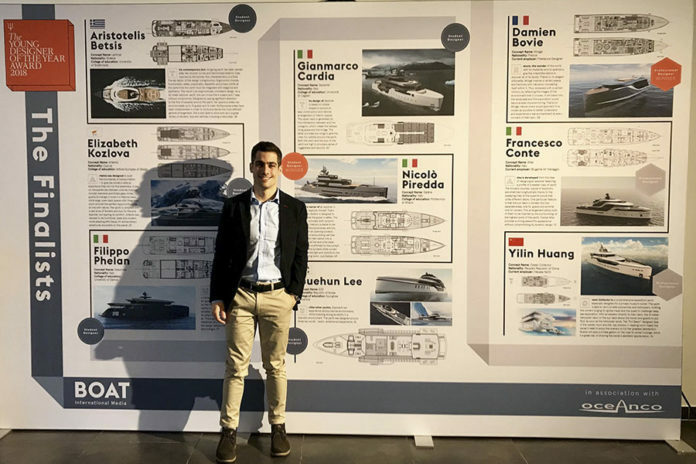 Since 2017, he has been a student of the two-year master in Yacht Design held by the School of Design, Politecnico di Milano: during his master, he is having the opportunity to develop the concepts for a sailing and a motor yacht. He is currently collaborating as an intern in the Italian design studio AM Yacht Design by Alberto Mancini. Since 2016 he is also co-founder of MPM Design, along with Lorenzo Melis and Gabriele Milanese, a studio composed of a small group of young interior designers. The winner for the professional category, the freelance designer Bovie, won with his Mirage concept due to its excellent presentation, practical ideas and beautifully drawn general arrangement. 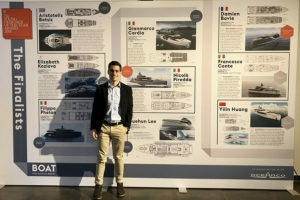 As part of their prize, Bovie and Piredda will take a tour of the Oceanco headquarters in May along with the other 2018 Young Designer of the Year Award finalists Aristotelis Betsis, Gianmarco Cardia, Elizabeth Kozlova, Guehun Lee and Filippo Phelan. Moreover, Piredda will spend three months learning directly from the Oceanco design team as part of an exclusive work placement.